Tom Lee of Fundstrat Global Advisors believes that the fair value of Bitcoin is around $14,000. The research chief and managing partner at Fundstrat also says that the old Bitcoin whales are back and have begun to buy back massively due to a shift towards positive market sentiments. Bitcoin had a rough 2018 and for much of 2019, it has been steadily climbing and from what we can gather, it is because there are a lot of positive things taking place. A lot of the old whale wallets are buying Bitcoin. According to Lee, many of these old whales liquidated their BTC holdings back when bitcoin price almost topped $20,000 in mid-December 2017. It would seem like there is a shift in market sentiment towards the positive end of the spectrum. Earlier in the year, Lee published Fundstrat’s outlook for 2019 which included a trend reversal for the market as a whole. Lee believes that developments like Bakkt and Fidelity’s custody solutions will act as tailwinds pushing BTC price even higher in 2019. Also, Lee pointed towards the growing utility of Bitcoin in places of economic unrest around the world. In places like Venezuela and Iran, people are continually turning towards Bitcoin and other cryptocurrencies. As previously reported by Bitcoinist, the U.S. government is reportedly looking to ban Visa and Mastercard from facilitating payments in Venezuela. Such moves only serve to push more people towards adopting Bitcoin. On the subject of BTC’s price, Lee returned his previous assertion that the top-ranked cryptocurrency is still trading below its real value. According to the Fundstrat managing partner, Bitcoin’s fair value is somewhere around $14,000. Going by Lee’s assertion, BTC is currently trading at less than 40 percent of its fair market value. For Lee, an accurate valuation for Bitcoin takes into active addresses and activity per user which points to BTC being worth around $14,000. The Fundstrat research head also based his valuation on the fact that a commodity should trade at 2.5x its breakeven value during a bull market. However, this assumes a breakeven BTC mining cost of between $5,000 to $6,000. Since the April 2, 2019 surge, much of the talk has been centered on where BTC will end up at the end of the rally. Despite a Thursday’s price pullback, BTC price is hovering around the $5,000 price level, which is serving as support. 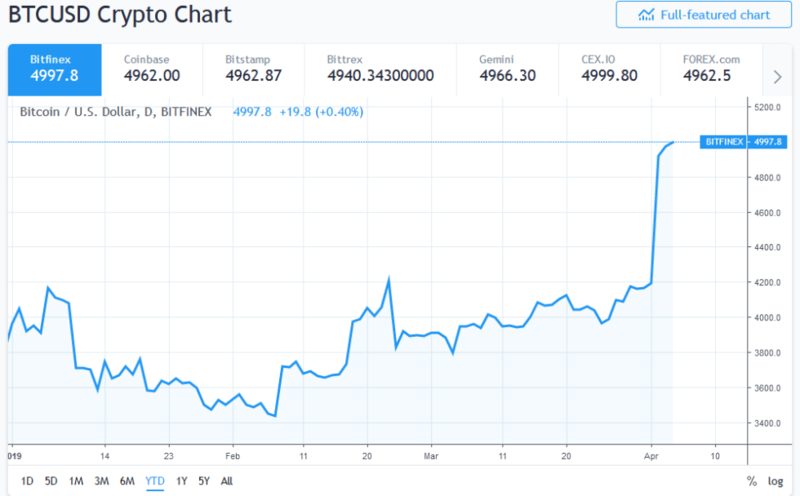 Brian Kelly of BKCM forecasts that BTC could go as high as the $6,000 to $6,500 price range. For many commentators, the question is what the new psychological resistance price would be now that bitcoin has broken $4,200. Do you agree with Lee’s assertion that Bitcoin’s fair value is around $14,000? Do you think can go as high as that price level in 2019? Share your thoughts with us in the comments below. The post Tom Lee: Bitcoin ‘Fair Value’ is $14,000 Right Now appeared first on Bitcoinist.com.